The quickest way to get from Ko Lanta to Krabi Airport is by Express Transfer, combining a van transfer from your Ko Lanta hotel to Saladan pier, a speedboat ride from Ko Lanta pier to Krabi Pier, and then a 45 minute air-conditioned minivan from Krabi Pier to Krabi Airport. If you have not booked your Ko Lanta hotel yet, please visit our Ko Lanta Hotels page to help you choose the hotel best for you. Please state your Airline, Flight Number, Destination and Time Of Departure from Krabi Airport e.g. "Air Asia FD 3241 to Bangkok - depart Krabi 07:45". Please use 24-hour clock. The Express Transfer speedboat will first depart Koh Lanta at 06:30, letting you arrive at Krabi Airport by 08:00. If your flight departs before Domestic flights 09:00 or International flights 10:00 we are unable to transfer you. Please select a different flight. Click the Pay Now Button to pay online securely using your credit card. All payments are processed by PayPal for your security and convenience. Need a Krabi Airport to Ko Lanta transfer instead? See our Krabi Airport to Ko Lanta page. You are transferred from your Ko Lanta hotel by car to Saladan village pier. You then go on board the speedboat which takes you on a stunning boat ride across the water along the coastline of Ko Lanta. The journey takes around 15 minutes depending on weather and conditions. When you arrive at Krabi speedboat pier, you are transferred to an air conditioned minivan. It’s a 45 minute to 60 minute journey from Krabi pier to Krabi Airport. The earliest speedboat departure time from Koh Lanta is at 06:30. This will get you to Krabi Airport by approx 08:00. Select your flight and hotel on the booking form below to see your hotel pickup time. 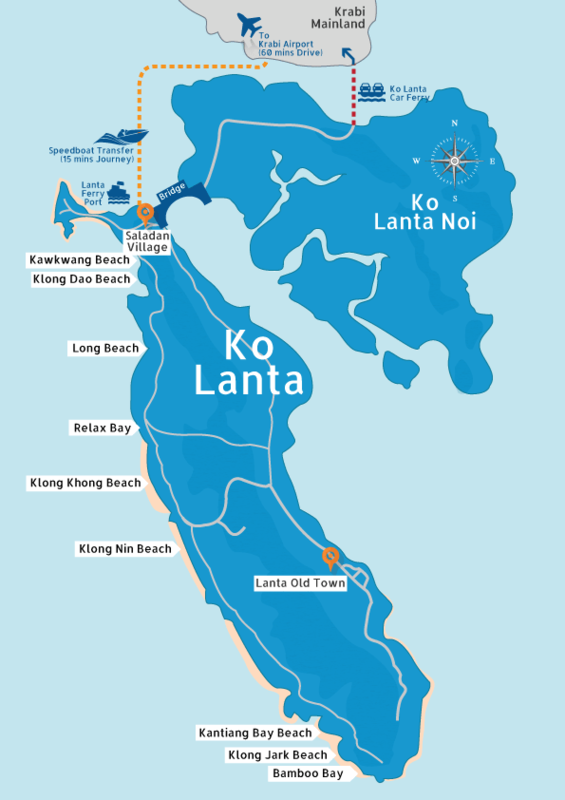 See the map of Ko Lanta for a sense of the distances covered and to orientate yourself. Who Provides The Ko Lanta to Krabi Airport Transfer Express Service? Your booking and payment will be processed by the customer care team at Amazing Lanta. When make your booking, you will receive a confirmation email from Amazing Lanta. You will also receive a separate email from PayPal confirming the purchase amount. The minivan and speedboat service are provided by South Online Travel. Amazing Lanta act as the booking agent for South Online Travel. You need to know your flight arrival and departure times before booking a transfer. There are numerous daily flights to Bangkok from Krabi Airport as well as several direct international flights. Check Skyscanner to compare all airlines’ flight departure times and prices. Before you book your transfer, you need to know where you’re going to stay on Ko Lanta – otherwise the transfer driver won’t know where to pick you up! Check availability and pricing for Ko Lanta hotels on Booking.com. 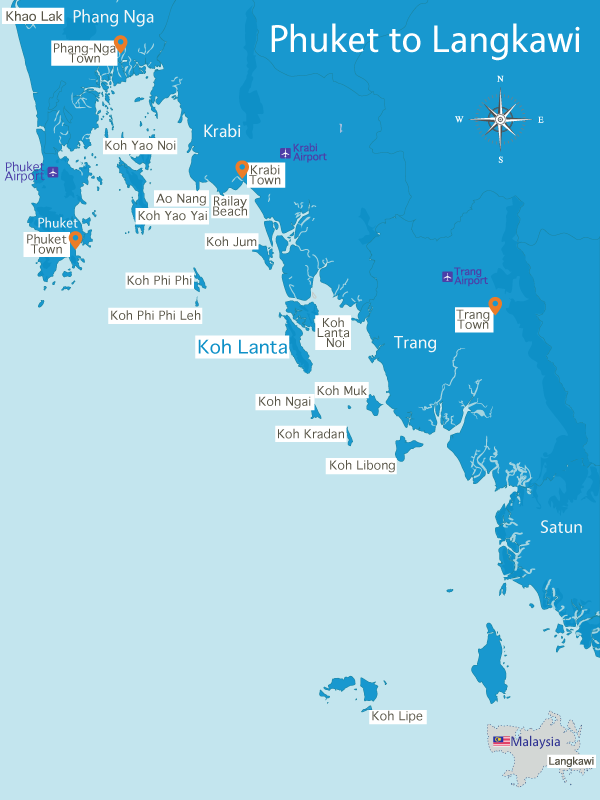 Also see our page Where To Stay On Ko Lanta to help decide which beach is best for you. It’s important when travelling in Thailand or anywhere in the world to make sure you’re prepared for the unexpected. Travel insurance protects you in case of medical emergencies, lost baggage, delayed flights and a whole load of other situations. Give yourself peace of mind by getting travel insurance. World Nomads is recommended by Lonely Planet and National Geographic – you can buy online in a couple of minutes. Explore the amazing islands surrounding Ko Lanta by ferry, speedboat and longtail. See our Ko Lanta ferries page for more info. :: Find flights to Krabi Airport, the nearest airport to Ko Lanta, with Skyscanner - one search will show you the prices and times from scores of airlines for your trip. A real timesaver. 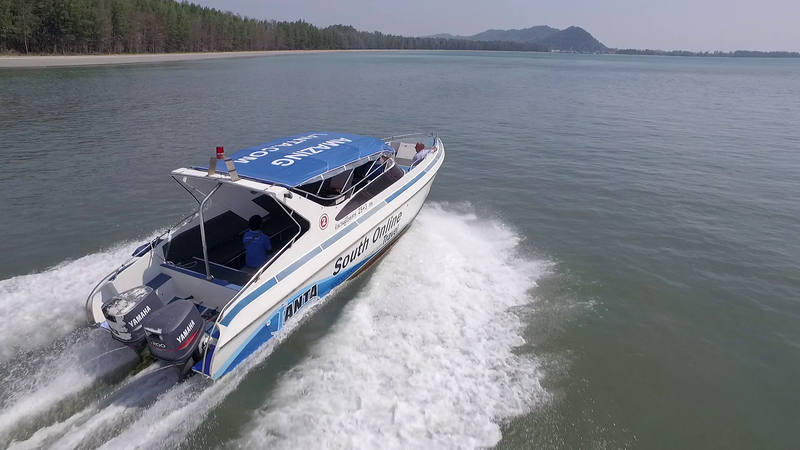 :: Once you've decided your flight, the fastest way from Krabi Airport to Ko Lanta is the exciting speedboat Transfer Express - book your Transfer Express online. :: Find available places to stay on Ko Lanta at Booking.com - usually you can reserve a room with no upfront payment. Pay when you check out. Free cancellations too. :: Need inspiration on where to stay? See Where To Stay On Ko Lanta for our hand-picked choices and view Ko Lanta Villas available to rent for a special, private place of your own. :: Travelling on from Ko Lanta? Book Thailand bus, train and ferry tickets Thailand with 12Go - an easy to use website that lets you check timetables and buy tickets online.